The problem with more-affordable blenders is that most of them just aren’t built to last. In many items, this can be attributed to a cheaply made plastic drive assembly which can break down after a couple dozen uses and leave you with bitter buyer’s remorse instead of a sweet milkshake. Oster has recognized this problem and equips even its more affordable models like the Reverse Crush with an all-metal drive that’s built to last thousands of servings without failing. Couple that with a generous 10-year warranty, and a clever user interface, and you’ve got a versatile blender that won’t break the bank, but will break down all but the toughest greens. The mix of traditional appearance and modern interface goes over well, but it’s a shame that the burnished steel isn’t real. Each button is lit up, big, and clearly labeled. While blending is straightforward, you’ll also need to get the measuring cup dirty if you want to precisely follow recipes. All-metal drive, excellent glass jar, and great warranty ensure that you’ll be using this blender for a long time. Overall a well made blender at a fantastic price! Here's a good unboxing video I found on YouTube, that gives you a very detailed look on what you get when you buy the Oster Reverse Crusher. The Reverse Crush is ideal for people who just want to plop their ingredients in, turn a specific setting on, and enjoy consistently great results each time they feel like drinking a smoothie. For everyone else, Oster has made the wise choice of equipping the blender with an interface that’s easy to use, yet offers you a fine deal of control with its various power and pulse settings. Anyone who appreciates outstanding customer support will also find that Oster is a brand that takes their customers’ satisfaction and complaints seriously. They back this claim up with a 3-year satisfaction guarantee and one of the best parts guarantees in the business. Unlike other blenders in its price range, the Reverse Crush doesn’t come with all that many accessories, probably because of the outstanding quality of the pieces you do get. Its packaging includes the base unit, a large 48-ounce glass jar with a plastic O-ring and lid, a six-pointed blade, a measuring cup, and a user’s guide that doubles as a beginner-friendly recipe book. The Reverse Crush is an imposing sight; its tasteful black color and silver finish will definitely enrich your counter when it comes to aesthetics. Guests will probably mistake it for a more expensive model as it looks like the trim is made from quality burnished steel. Unfortunately, the steel is actually plastic. Performance is much more important than aesthetics, and that’s where this blender generally shines. We were particularly pleased with the way in which you can either customize every aspect of the blending process or just let the Reverse Crush do its thing. The user interface consists of 9 buttons. All except the off button are lit up by LEDs so you always know exactly which setting is currently active. Manual blending lets you select between three speed settings and two pulse settings. The pre-programmed buttons are labeled ‘Frozen Drink’ and ‘Food Chop.’ ‘Frozen Drink’ is ideal for soft-served ice creams, smooth milkshakes, and creamy smoothies without any seeds. ‘Food Chop’ is a bit of a misnomer as this setting will slice and dice your ingredients into a fine pure. It’s great for salsas, dips, and baby food, but don’t expect it to be able to chop up onions for a salad. The blades this blender comes with were designed to rotate both ways while the ‘Frozen Drink’ setting is active. They have six tips, two of which face downwards. These downward tips prevent chunks from building up, and combined with the reverse function, they make sure that no ingredients ever get stuck to the bottom. The result – creamier desserts without even a hint of seeds or skins. The driving force behind these efficient blades is a powerful 1000-watt motor. Even when filled to the brim, the motor will make short work of the blender’s contents. Want to crush ice? Go ahead. Can you make peanut or almond butter? Just keep in mind that the motor is VERY loud, so making a smoothie before your morning jog might wake the family up. The glass jar is another standout feature. It can be machine washed along with the BPA-free lid, handles stresses, and temperature differences extremely well, and can store hot liquids too. There are no measuring marks on it, which means that you’ll need to use the accompanying measuring cup if you want to follow along to recipes. Some are even included in the user’s manual to get you started. 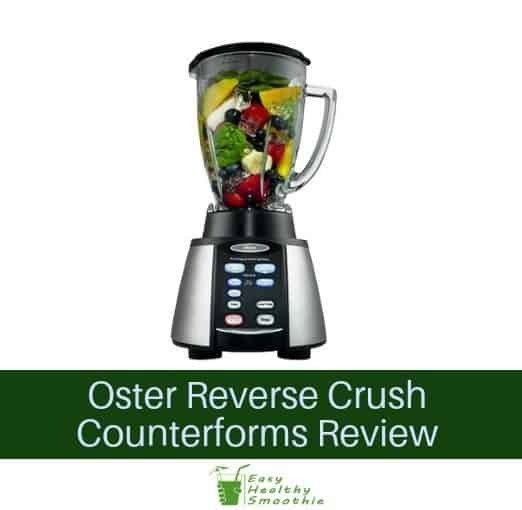 We highly recommend the Oster Reverse Crush for a number of reasons. You get a well-made blender at a fantastic price, the different settings allow you to prepare diverse meals, and everything is super easy to clean and store afterward. The few drawbacks it does suffer from are hardly drawbacks at all, and we were quite surprised that we couldn’t find anything more serious. If there ever was a blender you could show your Vitamix-using friends and be proud of spending five times less, the Reverse Crush is it.